Profile by Vicki Stittleburg: Based on the name of this bird, one might assume that it has a bright red belly; however, the Red-bellied Woodpecker's "red belly" is only a small reddish area that is difficult to see in the field. This bird has a black and white barred back, white uppertail coverts, grayish white underparts, black chevrons on the lower flanks and undertail coverts, and barred central tail feathers. In flight a small white patch shows at the base of the primaries. In adult males, the entire crown, from bill to nape, is red. In adult females, the red on the head is limited to the area just above the bill and nape. 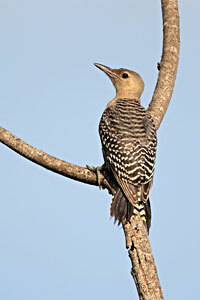 Red-bellied Woodpeckers are common throughout the year and can be found in open woodlands and in suburban areas with mature trees. The bird uses its long, barbed, sticky tongue to probe for food in bark crevices. Like most woodpeckers, they eat many insects, but they will also consume seeds, nuts, fruit, tree sap, small amphibians, bird eggs, and small fish. 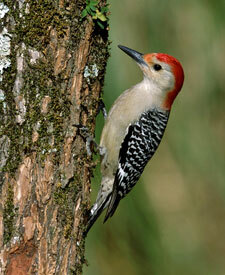 The Red-bellied Woodpecker’s most common call is a shrill, rolling churrr given by both sexes. Since they can't sing like songbirds, Red-bellied Woodpeckers communicate by drumming, hammering against a loud or resonant object. They will hammer trees, wood siding or metal flashing around chimneys to announce breeding territories and to attract mates. If you have mature trees in your yard, you have good habitat for the Red-belly. They rely on tall soft trees such as pines to excavate their nest cavities. Convert dead or dangerous trees to snags (20 feet or higher) which can be used for cavities. Red-bellies eat acorns, insects, and fruit, and are also known to store food. They willingly come to feeders for sunflower seed or suet.